This morning's #SatChat moderated by @DruTomlin_AMLE truly resonated with me as the focus was on "Leading Schools and Education Reform" with a focus on what are change agents and how do they facilitate change in a school or organization? The tweets were fast and furious but I wanted to take time today in this blog post and reflect upon my answers and others. Q1 7:36 What are the characteristics of an effective change agent in a school? Dru posed a terrific question and I could fill several blog posts on this questions alone. 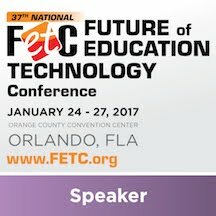 In my role as Director of Educational and Information Technology, as technology moves at a rapid rate; my daily role is slowing things down so that I make pedagogical, budgetary, leadership, and operational decisions based on our collaborative and thoughtful strategic academic plan, not on what is the latest #EdTech product. I have a very clear vision distilled from that academic plan and I am consistently navigating toward those embedded goals. When Dru posed his question this morning, my reply was easy as I have only been successful in realizing my vision because of the relationships I have invested in. Relationships are key in shaping my vision as I am fortunate to work with an amazing leadership team and a strong and creative faculty. If you work toward garnering a strong foundation of trust and can clearly communicate your underlying"why" of your vision, you have a high degree of success likely. Of course, you will need to persist through the challenges that any change brings. I like to think of these challenges as the necessary checks and balances to ensure that you are on the right path. Randy Pausch, author of The Last Lecture, called these challenges "brick walls put there to see how much you really want something'. So persistence is another key characteristic of an effective change agent but that also requires being patient, having a deep well of humor and yet one more key characteristic, a strong EQ. Change is hard and possessing a strong emotional intelligence (EQ) will help you work through some of the more human challenges. 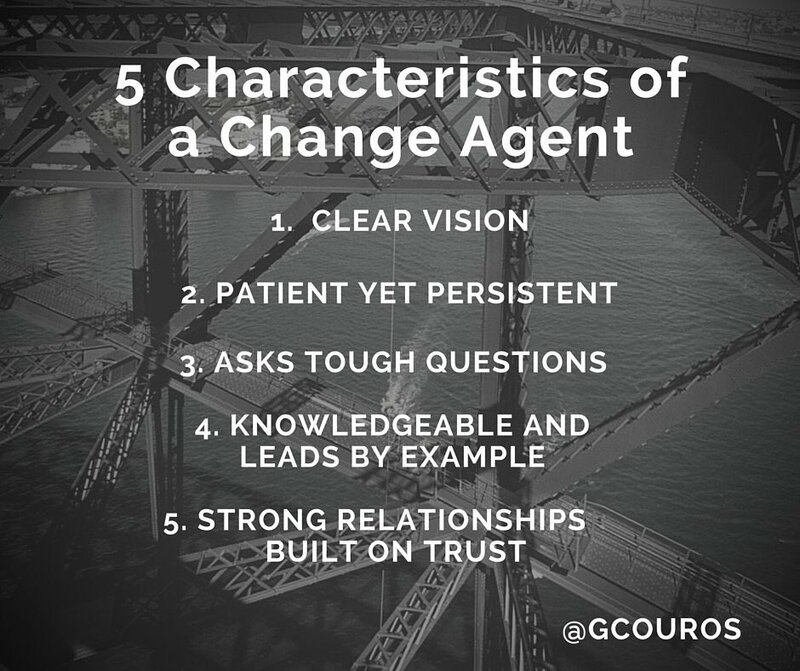 Someone in the chat reminded me of the excellent post George Couros (@gcouros) wrote in 2013 that "5 Characteristics of a Change Agent"which summarize the key characteristics of an effective change agent. Q2 7:44 How do you create and sustain change as a school leader? While persistence is key, you need to lead by example. Sometimes that means you are a cheerleader, sometimes a shepherd and every once a while, a wrangler. All of this requires that you take care of yourself as you will need a lot of stamina on those more challenging days. @BeckettHaight is right though, you need to set your priorities and keep the end in mind. Q3 7:52 What is one reform that you are working on at your school? Why is that so critical? Staying true to your vision and mission through a collaborative and thoughtful academic strategic plan provides a fairly clear road map toward achieving your goal (s). Design Thinking has been and will continue to be a focus as it builds nicely upon of culture of visible thinking and moves us closer to creating a culture where asking the right question is more valued than giving a "right" answer. It was fascinating to see the breadth of reforms that schools/organizations are working on from grading to innovation to technology usage. Change is hard but realizing how many educators are in similar positions to your organization is helpful.Virtual support and guidance abounds in twitter making it the best source of professional development. 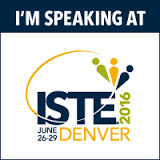 Q4 8:00 What resources (tech, articles, books, protocols) do you use to foster change and reform? My PLN is a formidable resource and sounding board but don't forget the community around you. take time to ask tough questions as George Couros suggests and listen with an open heart to the feedback of your team. Sometimes the feedback may not be what you want to hear but if you have a strong team, they will keep you honest. Q5 8:08 How do you help external stakeholders (families, district) understand and work on school change efforts? Communication is key but you need to remember that communication must be two way. Seeking feedback from all your stakeholders is essential. Although this tweet occurred earlier in the chat, @jbhanlon underscores the need to develop a supportive culture where all voices and input are welcome. Q6 8:18 If reform was a food for schools, what kind of food would it be and why? 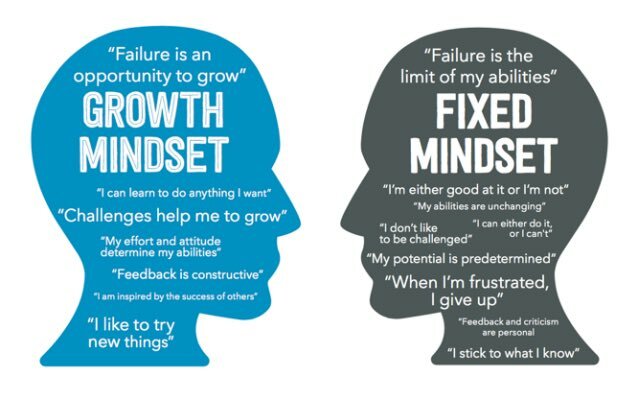 In the end, I believe that above all else, transformational leaders have a growth mindset and encourage this culture in those around them. I love this image below posted by @miriamcheuk today. Transformational leaders enable change because they themselves believe in growth, they understand the risk of change but they also believe in being bold and taking worthwhile risks. Be bold, listen, lead with your mind and with your heart and in the end, keeping a focus on what is best for your students will provide the right culture to change when necessary. Apple Teacher is a excellent program of free professional learning Apple Education released last summer in the United States. Through a digital badge system, Apple recognizes each mini-course you successfully complete. The mini-courses include badges in Pages, Keynote, Numbers, iMovie, GarageBand, Productivity and Creativity in either iPad or Mac strands. I highly recommend completing matching mini-courses in both strands concurrently, i.e. complete the "Keynote for iPad" and the "Keynote for Mac" at the same time as it helps you understand the nuances of a program based on the device you are using. There are also coding badges available in the fabulous Swift Playgrounds covering basic coding concepts through implementation in the classroom. So why sign up? Rich resources. Each mini-course has a fabulous multi-touch starter guide with step-by-step instructions, classroom examples and helpful tips. Self-paced. No one needs to know you are learning in your pjs! Learn what you want, when you want. Build a strong foundation in the Apple ecosystem. Forming a solid understanding of iWorks (Pages, Keynote, Numbers) and learn how they fit together and extend learning. The Apple Teacher community (#AppleTeacher) is a wonderful way to grown your Professional Learning Network (PLN). Different perspectives. In the Apple Teacher program, you are learning from the best of the best. These teachers use technology in such interesting ways and you will gain new perspectives on how to use technology in your classroom. I never thought about using Numbers to organize students' research for example. Evolution. Apple Teacher is a program that learns and grows with you. The recent addition of Swift Playgrounds is the first example but I am quite certain we will see more added to this program. Classroom ideas. 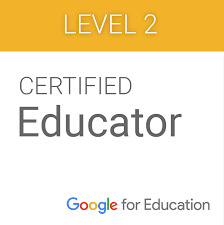 You will learn not only how to master certain apps but also gain new ideas in how to implement in your classroom. Real life, practical learning! Magical. When you go outside your comfort zone, that's where the magic happens. Perhaps you have been hesitant to learn spreadsheets, or coding, or GarageBand (I know I was!) - well, this is the perfect program for you. Stretch your learning and take a risk - - you never know where it may take you. Professional recognition. In most fields today, professional learning is key and education is no exception. 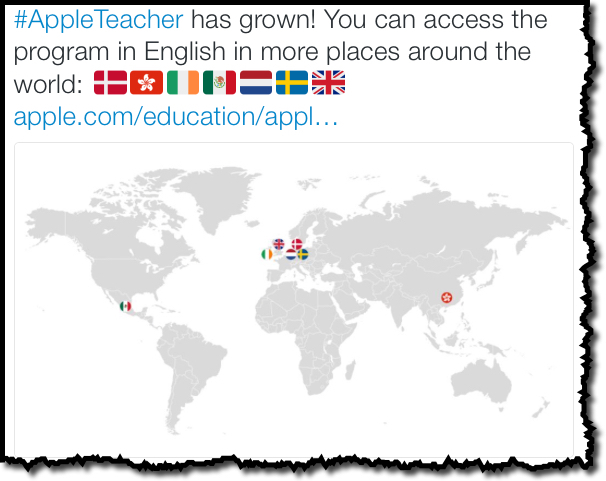 What's lovely about the Apple Teacher program is you are earning professional badges from a highly respected educational company which will transfer no matter where you go. Apple Teacher is expanding around the world! It's truly a blessing and a curse, our students have immediate and broad access to information yet they do not know how to discern fake information from real information. In our current political climate, the situation is exacerbated. When I first began to teach digital fluency at NBPS, I always began with Eli Pariser's Ted Talk on filter bubbles. It's a powerful piece but never seemed to really sink in with students as much as it did with our faculty. However, in today's world where our president complains of fake news, students are now more aware of the issue. However, the question still remains, how best to teach our students to discern the fake from the real? Some recent sources on this thorny issue may help. Any other fab resources out there? Let me know in the comments! Have you wanted to find a simple yet creative way to have your world language students demonstrate their understanding and articulation of whatever language you teach? Book Creator to the rescue! As I have written before, it is truly the Swiss army knife of apps! Recently, my colleague Amy Jonas, the chair of our World Language and Culture department began an amazing project with her Spanish 3 students. The students wrote a simple yet entertaining animal story and illustrated these stories (sometimes with hilarious photos of their pets). The students were required to write the text in Spanish and attention must be paid to the correct spelling and grammar. The students had a very easy time adding the text and illustrations to their books in the Book Creator app. All of their work and illustrations had been saved into their Google Drive so that Amy could provide feedback as the projects progressed. Once that part was completed, the students went through a simple cut and paste operation into the Book Creator book. The app learning threshold is low yet the app is so versatile as to allow them to add photos, clip art, video or to draw illustrations within the app. The students then presented their stories in class, reading the text aloud in Spanish as they turned each page (this is an easy feat since we are 1:1 iPads with an Apple TV connected projector in each classroom). The students were assessed on the creativity of their stories, their presentations and on their correct use of language. Part two of the assignment is to go back into their books and add audio to each page. Once the books are finished, these high school students will bring their books over to the Lower School students to share. The books will be published to the community as well. Giving our students an authentic audience validates their work and provides a higher purpose and motivation to write a stellar story. 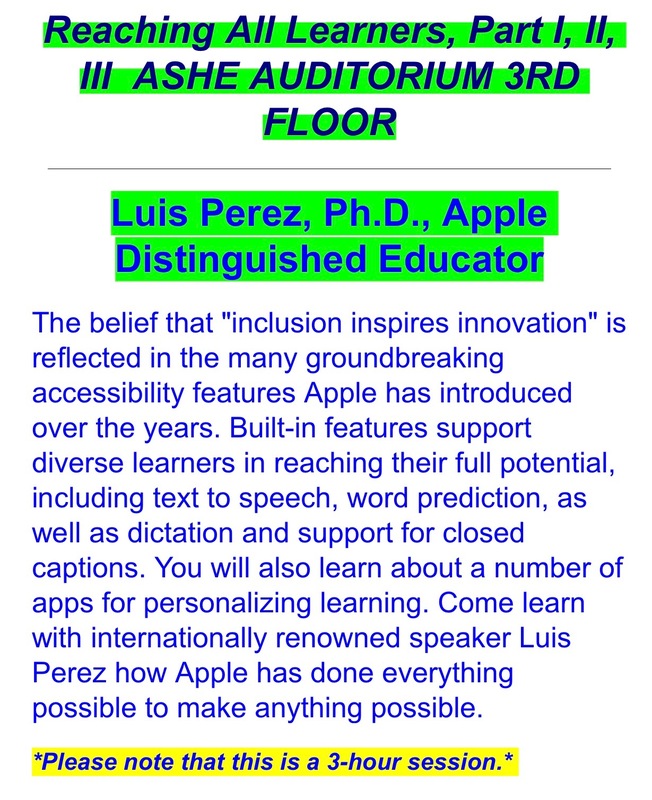 At the wonderful FCIS (Florida Conference of Independent Schools) conference, many of our faculty were able to attend one of the best learning events I have ever witnessed, 3 amazing hours with Luis Perez, Apple Distinguished Educator and accessibility evangelist. Luis is one of those rare educators who has the knack of making everything he speaks about relatable. You cannot leave one of his workshops without feeling that it is imperative for you to implement and educate your students and parents on accessibility features. Apple, of course, is the king of accessibility. It is part of their DNA and Luis showed us over 3 hours just how important these accessibility features are to learning. It is all about equity not equality. After the conference, I had a chance to read Luis's book, Zoom In. While this book is intended for teachers who may work with students with low vision, I found it to be a tremendous inspiration to use with all students. In Zoom In, you will find a wealth of material that will change our perspective on how you present everything. I highly recommend reading it and rethinking everything from how you write on the board, to classroom decorations to handouts and presentations. It is truly an opening book. At NBPS, we have a school within our school called Lighthouse Point Academy, for students with mild to moderate learning disabilities. We also have about 350 students from around the world who speak over 42 different languages. So accessibility is a game changer for us. 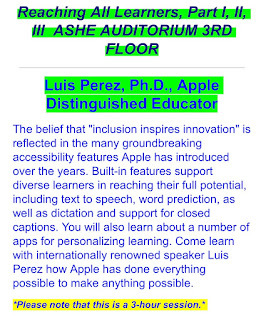 I thought our August PD addressed this area, but Luis's session was so powerful. It was truly his influence which inspired our faculty to really pay attention to this issue and I cannot thank him enough. Several months prior, we had once again included an overview of the accessibilty features available on the iPad and on our Mac computers. We crammed a lot into 45 minutes but what we did differently this year is that we also met one on one with every student and parent as part of our iPad distribution over the summer. Each appointment was about an hour where most of that time was dedicated to showing off these accessibility features. Parents are our partners in learning so it made perfect sense to include them in this communication. During these appointments we mainly focused on three areas of iPad accessibility: read to me feature, dictation and visibility. Parents were amazed to see that they could use these features on their iPhones as well. It was a win win situation for all.